The roar of motorcycle engines is filling the air in the nation's capital. Organizers say hundreds of thousands of bikers and spectators gather every Memorial Day weekend for the Rolling Thunder "Ride for Freedom." The event got its start in 1988, and it honors military veterans and members of the military missing in action. Bikers rally at the Pentagon all morning Sunday, then cross the Memorial Bridge at noon and cruise around the National Mall. Drivers throughout the region should watch out for a large number of motorcyclists on the roads all weekend. As hundreds of thousands of motorcycles race into the District for the Rolling Thunder Ride to Freedom, so will some road closures. The annual event honoring military veterans and soldiers who are missing in action will begin May 24 at the Pentagon at 7 a.m. 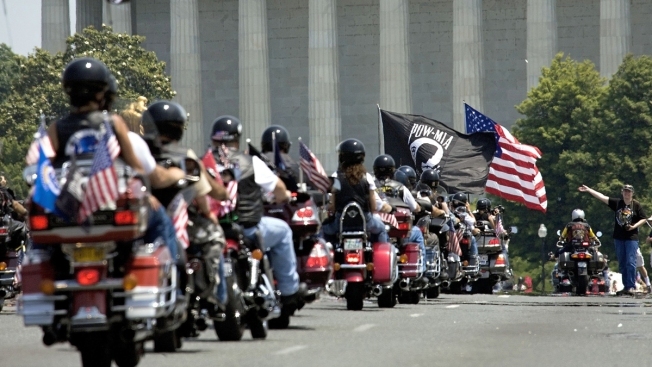 Given their name because of the roaring sound their bikes make as they ride in unison, Rolling Thunder will enter D.C. via Memorial Bridge after they’ve filled both the North and South Pentagon parking lots with motorcyclists. They’ll then ride around the National Mall. Northwest on Ohio to Franklin D. Roosevelt Park, where the motorcycles will then disband.